The arrival of the 8th Gen Blade Stealth Ultrabook came as no surprise - Razer was always going to take the opportunity to refresh its machine with a quad-core processor - but we hadn't expected to see a new-and-improved external graphics enclosure quite so soon. Core v2, launched alongside the upgraded Blade Stealth, follows in the footsteps of the original by promising to "seamlessly transform highly mobile Thunderbolt 3 laptops into a desktop-class gaming experience." The premise is simple enough; take a desktop graphics card, pop it inside the Core v2 enclosure, attach to a compatible laptop via a single Thunderbolt 3 Type-C cable and tap into all of that GPU goodness. That's the theory, but external graphics solutions have a rocky history, and real-world usage is rarely straightforward. Our experience of the original Core revealed that actual performance was below expectations, and others reported instances of patchy connectivity when using the integrated USB hub. So what exactly does Core v2 change or fix? At first glance, the upgrades aren't immediately obvious. Razer's official product page plays it coy by proclaiming "an all new internal design with improved headroom for larger graphics cards," but the chassis looks practically identical. Razer continues to use an all-aluminium enclosure that feels rock solid and flaunts two Chroma RGB lighting zones (one internal, the other in the front). 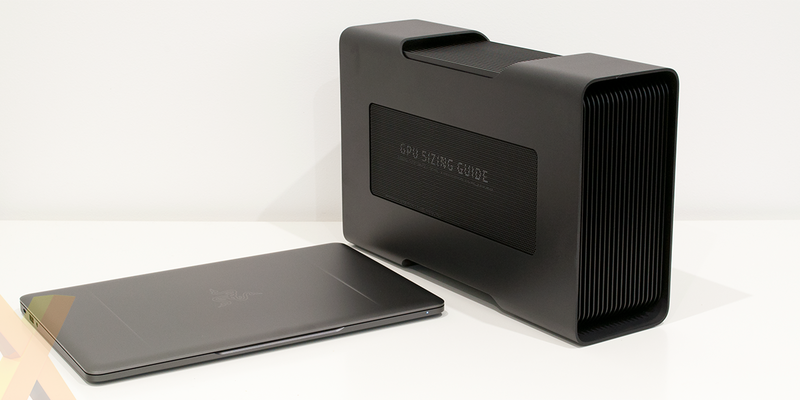 External dimensions are identical at 104.9mm x 339.9mm x 218.4mm, and connectivity hasn't changed, either, with the back of the unit integrating four USB 3.0 ports, Gigabit Ethernet, Thunderbolt 3 and a connector for the mains power lead. It's aesthetically the same box, but a couple of internal tweaks have paved the way for a larger graphics card. You're still limited to a length of 300mm and 43mm of width (ruling out anything meatier than a dual-slot solution), but your board of choice can now measure up to 145mm in height. 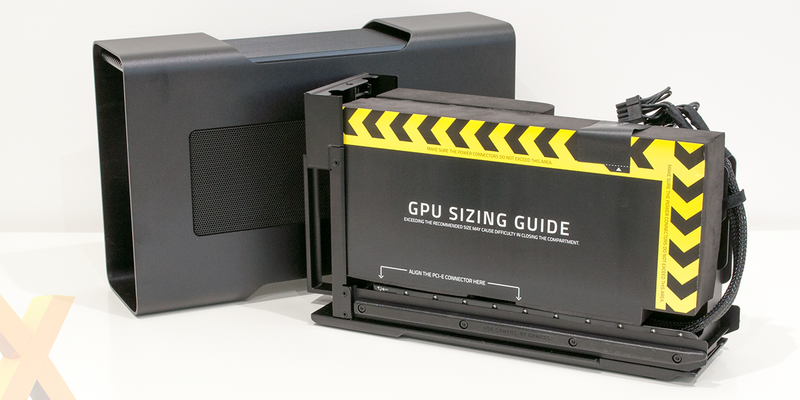 A foam GPU sizing guide helps weigh up your card's suitability, but the extra 15mm of headroom is hardly anything to write home about, so what else is new? 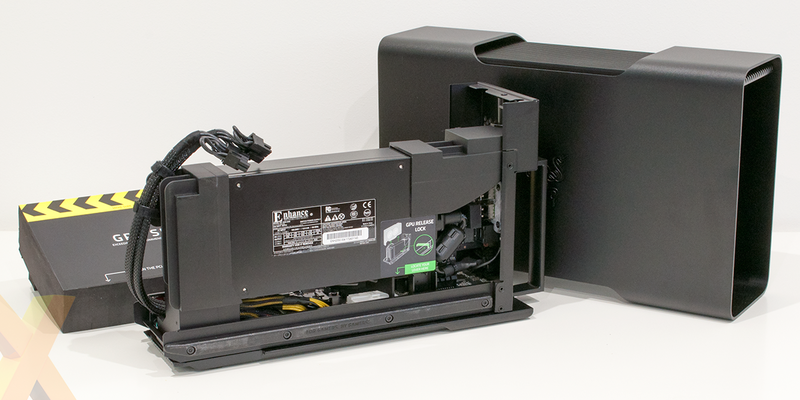 The key change, it turns out, is that Razer has added a second Thunderbolt 3 controller to minimise contention and route traffic in a way that ensures GPU priority at all times. We don't imagine this change will aid graphics performance in any significant way, however having a dedicated controller for the GPU and another for the I/O ports does result in improved USB and Ethernet stability; we've been using our peripherals connected to Core v2 for the best part of a week with no unexpected dropouts. Elsewhere, it is much the same proposition. As before, the guts of the equipment pull out from the back via a handle that disengages the lock when used. Do note that this isn't a carry handle - attempt to pick up the unit from the back and you'll send the aluminium case crashing to the ground - but it makes light work of getting inside the unit. Once opened, the central tray reveals an expected 500W power supply with a 40mm fan either side and a further trio of 60mm fans dotted around the base of the unit and directed up. The fans on the original Core were a sore point due to irksome noise levels, and we're surprised to find that Core v2 isn't any quieter. Razer has decided against attempting to improve the thermal design, and that's a shame as the fans create quite a racket. Even if the graphics card is cool, the five blowers alternate speed dramatically and unexpectedly, creating an inconsistent noise profile that's highly distracting. Truth to be told, we wouldn't be comfortable using the unit without a good pair of headphones to mask the commotion. Installing a GPU is satisfyingly simple. Remove the backplate via a single thumbscrew, pop your graphics card into the PCIe slot, put the screw back in and attach the pre-routed power cables. It couldn't get much easier, though of course size remains an important consideration. 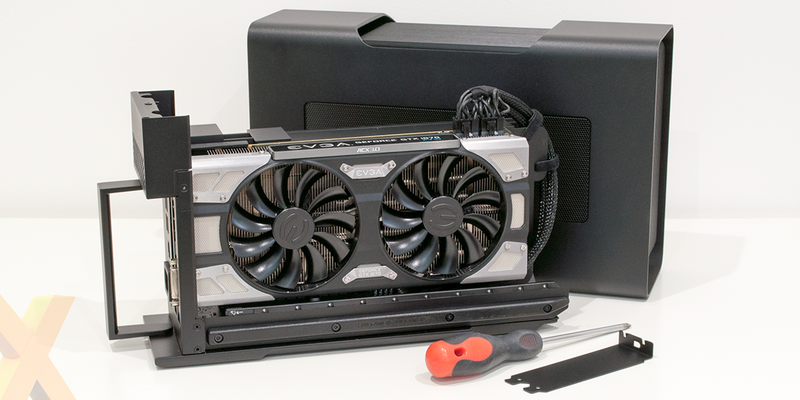 We attempted to install an ultra-high-end MSI GeForce GTX 1080 Ti Gaming X Trio but couldn't close the lock with the card in situ and so had to settle for a more appropriate EVGA GeForce GTX 1070 FTW. It is a nice thought to be able to add a proper gaming card to a laptop equipped with relatively feeble onboard graphics, but do be aware of potential compatibility issues. Core v2 is designed to be used with a Razer Blade, Blade Stealth or Blade Pro laptop, and though it should in theory work with other Thunderbolt 3 machines, you'll be relying on your system manufacturer to ensure external graphics is supported. When paired with our Blade Stealth review machine, Core v2 functioned effortlessly. Windows 10 detects the GTX 1070 as a plug-and-play addition, and it's handy being able to hook-up peripherals and a wired Internet connection for a proper gaming session. 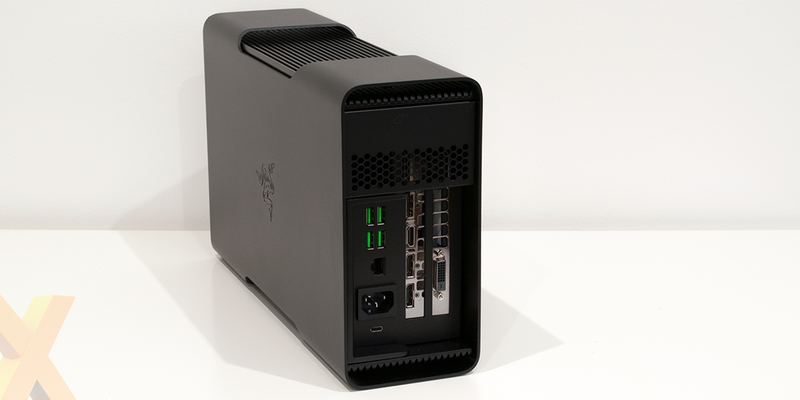 If there's a criticism it's that we'd liked to have seen Razer expand the I/O options for this v2 revision - an extra Type-C port wouldn't have gone amiss, and come to think of it neither would a storage bay for game data. The bundled Type-C cable for connecting Core v2 to the laptop is frustratingly short - presumably to minimise latency - but there's little in the way of cable clutter as Blade Stealth is powered and charged via the single Thunderbolt lead. We assume gamers are the target audience, but it's worth noting that Razer's list of supported GPUs includes Nvidia Quadro as well as the usual Radeon and GeForce fare, which could be beneficial to anyone wanting an ultra-portable laptop to double as a workstation when docked. External graphics as a concept holds plenty of promise, but Core v2 does come with another proviso in that it still costs a whopping £470. Remember, that's for the enclosure sans graphics card, and when you consider the spiralling prices of today's GPUs, total cost of ownership is significant. Not one for the faint-hearted, but enough of the pre-amble, we're intrigued to see how Core v2 responds to our various benchmarks so let's get to it.